Reinventing ourselves comes from within. It does help to have a planetary shift similar the one we had on the winter solstice December 21, 2012 which coincided with the end of the Mayan calendar. 2018 was all about building and laying down a new foundation. The upcoming planetary shift in 2019 is all about making things tangible and material. So, if you have a goal or dream, this will be a new year to start making steps to transform your dream into reality. First, I found it necessary to reclaim the parts of myself I had lost, given away, or given up on. I suggest you do the same. 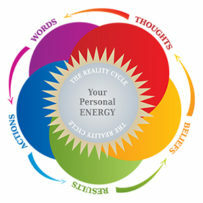 The Fusion Modality in the Resonance Repatterning® method retrieves lost qualities. It will free you to be more authentically who YOU are out in the world. In a workshop called, Owning My Purpose, one of the exercises we did was to inquire about what we did, or how we survived our family dynamics growing up. One of the things I discovered that I did to survive, to be acceptable and to get my needs met was to find out what the rules are and follow them. I then saw that even to this day, I find out what the rules are and live within the parameters of them, even if I do not agree with them, or even if have to settle. Growing up, I became the good girl, nice and pleasing. I found out what others needed and did whatever it took to make them happy–harmony at all cost! From there, in the quietness of my inner sanctuary, I created and later declared and claimed my purpose. I stood up in front of the whole group — and on camera to boot — owned my purpose. My purpose is to inspire and empower others’ greatness to live extraordinary lives! What I realized is that I am already doing that. Energy surged throughout my whole being and a rush of emotion filled my eyes. It was total validation of what I have been all about for many years. The group, was then asked to pick a project to fulfill within six months that would allow us to tangibly experience our purpose and move us into unhesitating action. I could not imagine taking on yet another project. 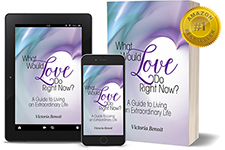 So, I chose one I had yet to complete: publishing my first book, What Would Love Do Right Now? A Guide to Living an Extraordinary Life. I created a structure to fulfill my goal with support from those who love and care about me. The paperback was published December 2017 by my own company which you can visit at www.ExtraordinaryOutcomesPublishing.com. The eBook came out in May of 2018 and got to #1 on Amazon the first day. It was exciting! Let me know how I can further support you. Success stories abound! Book on-line today.